Alembic Pharma on Friday has entered into the oncology segment by inaugurating anti-cancer manufacturing facility at Panelav, Halol, Gujarat. The manufacturing facility is designed with containment control automated standards and major equipment imported from Europe. With this facility, Alembic Pharma will commence exporting oncology products to US, Middle East, North Africa, Australia and South Africa. A rare precedent this in the Indian corporate scene. Minority shareholders demand a seat in the board of directors of Alembic Ltd.
India Business News: MUMBAI: In a precedent-setting move, small shareholders are pushing for a board seat in the country's oldest pharmaceutical company — the 110-year-old. Q118 results have factored in the news of lower sales and DE - Growth in USA in its stock price . Of the 3 vertices of the company Indian formulations, International formulations and Api Business there seems to be only 2 % growth in API business. Other 2 verticals have dragged down growth . So I can see not all the drugs at having a big market sales when compared to other products like Aripiprazole gAbilify, and there could be meaningful competition too in these drugs. I would watch the launches and DMF being filed by the company in future Quarters and the company has said that it would be launched 100 Anda commencing 2018 so which would be a great revenue drive I believe. Disc : Invested in ALEMBIC pharma , opinions are my own and can be biased. alembic pharma sells its baddi formulation manufacturing facility .Not sure of the motives here . could this be a red signal ? Dont know about the sale of Baddi unit here, but they are coming up with new facilities at Panelav. Construction of a new plant will start in few months. I got to know this as my job profile allows me to visit the clients in Gujarat and I get to know about the developments. As per press release the Baddi plant contribution was negligible. If you go 2-3 years back annual reports, it said that this plant was formulations plant for India and emerging markets. It seems that the plant either had low capacity or was not operational. Anyhow, there must be a land value at least. The recent ANDA approvals of Alembic have been petty change. Really very small market sizes. I wonder whether these will make any difference to their numbers. Another way to look at it is that there will not be much competition for such molecules. Could be worth asking in concall. Also another news announced yesterday. Drug Application (ANDA) Bupropion Hydrochloride Tablets USP, 75 mg and 100 mg.
Alembic Pharma FY18 Annual Report Notes. International Generics = 38% (77% = USA, Others = 23%), Branded = 41% (chronic = 67%, acute = 33%), API = 21%. Export = 56%, domestic = 44%. 16% in R&D, 900 employees in R&D. 26 ANDA filed in USA this year, total cumulative filings at 132.
work on our new oral solid dosage facility at Jarod is on track and will be completed by H2 2019. We have been on a steady path of expanding our capabilities and are in the course of creating major facilities of `1,100 Crores. Our upcoming manufacturing units for general injectables and oncology injectables are on track and should be ready for exhibit batches by H1 2019. Completed acquisition of Orit Labs in USA. Our acquisition of Orit Laboratories LLC will increase our breadth and capabilities in the US with a competent R&D team bringing complementary skill sets in soft gelatin based oral solids and oral liquids. US front end crossed $ 100 miliion sales in the current year with a growth of 69%. a) Bioequivalence located at Vadodara without any Observation. b) Formulation Facility at Panelav with three observations. None of the observations were related to data integrity or repetitive in nature. The Company submitted its response on the observations with USFDA. Invested Rs. 200 cr. Aleor Dermaceuticals Ltd. through NCDs. • Net Profit up 50% to Rs 98 crores from Rs 65 crores last year. • International Formulation business grew 25% to Rs 352 crores. • ElR Received from the US FDA for Panpharm Formulation Facility. • EIR Received from the US FDA for API Ill at Karakhadi. at 73 including 9 tentative approval. • 3 ANDA filings during the quarter, Cumulative ANDA filings at 135. • R&O spend at Rs 122 Crores, 14% of Sales. So is this the revival of pharma again ? Regulatory hurdles clearing. Dollar is strong. Shall we expect the rally in pharma again ? Alembic received approval for Bimatropost Opthalmic Solution. Estimated market size is USD 63 mn. Alembic is currently in litigation with Allergan for this product so the launch will depend on the outcome of litigation. Latest Credit Rating Report ofAlembic Pharma by Crisil provides some good insights. Revenue remained flat in fiscal 2018 compared to the previous fiscal, on account of destocking in the first quarter before rollout of the goods and service tax (GST) in the domestic market and price erosion in the US market. The operating margin, however, remained in line with expectation at 21%, led by cost-cutting measures and relatively lower R&D of 13% of sales. Revenue is expected to grow 11-12% over the medium term, led by recovery in the domestic market and new product launches in the international segment, which will partially offset the pricing pressure in the US market. The operating margin is likely to remain at about 19%, given the elevated R&D requirement (about 14% of sales) for building abbreviated new drug applications (ANDAs), particularly for specialised generics. Revenue growth is expected to recover over the medium term with regular ANDA filings and product approval cycle improves with the implementation of the generic drug user fee amendment (GDUFA). The company has large ongoing capex of Rs 1200 crore (commenced in fiscal 2016 and about 70% complete till fiscal 2018). With the project expected to be completed in fiscal 2019, the annual capex is expected to be about Rs 400 crore over the medium term. In March 2018, the formulations facility in Panelav, Gujarat, received three observations under form 483; the company has responded to these. In the domestic market, regulatory impact of drug price control order (DPCO) and ban on some Fixed Dose Combinations (FDC) has adversely affected revenue and profits in the past; and may continue to do so over the medium term. The portfolio remains significant in the acute segment (50% of domestic formulation sales in fiscal 2018), with top five brands from it accounting for nearly 40% of domestic revenue. The significant revenue share from this slow-growing segment exposes the company to pricing pressure as many companies compete in a mature segment. CAPEX for the quarterstood at 186 Cr and H1 is 342 Cr and additional 55 Cr is funded to JV in the quarter and total 110 Cr was funded to the JV in H1 . Total revenue grew by 38 % to 1990 Cr compare to last year same H1. PAT grew by 63 % to 105 Cr compare to last year same quarter. Valsana AP opportunity will lead to great US business . DerminitologyJV facility inspected and approved. R&D stood at 145 Cr which is 13 % of sales. Prefix-8 ended during the quarter received through Elliot . Prefix-4 tentative approval received during the quarter. 77 ANDA approval pending that include 17 tentative approval and launch 1 new product during the quarter. India Formulation business grew by 134 % to 587 Cr compare to 262 Cr last year same quarter. API business grew by 9 % to 155 Cr for the quarter. India formulation business was flat during the H1. Ratio of sales between accurate and specialty stands at 31:69 for H1 18-19. Did all upside capture in the quarter for the Valsane or is it something left that will come in next quarter? A lot of people have their supply so the juice in opportunity is much lesser. The market is also shifted to other products. So that opportunity now do not exist. Broadly everything is capture in the quarter. What is the company outlook on US base business going forward ? Base business has grown by decent numbers while there was a pricing pressure across the board and team has to take some price increase as well almost 25 % of portfolio seen price increase. The base business grown over 20 % for the quarter. The ROW market grew over 100 %. Did the increase in receivableis due to Valsane huge sales and payment pending to come ? Yes bulk of sales done in August and September so money is pending to come and receivable cycle does not increase. When will company start shifting the CWIP toward fix assets ? Capitalization will take little longer time but fresh investment on the project will not be happening. Depreciation will start when these assets will start commercial production. Did operating expense will start when commercialization of production start ? It has two parts. Broadly lot of expenses has started today also. Few expense will start after commercial production start. What was the reason for International growth of X of US ? Growth has been high because company had added some constraint on supply side. Company was able to ramp up lot of production last year also that led to higher growth and it is new base for the year. On the aggregate side is there a increase or decrease involume ? Decrease and it would be in single digit number. Will the increase in working capital cycle will get normalized in next quarter ? Yes almost will get normalized and there will be some inventory buildup which is faster than other new product. Receivables will get normalized in end of the quarter. For long term will the operating margin will sustained at current level ? Yes sure company will maintain it at level of FY18. Why India business growth was flat during the quarter ? Because last year in Q1 there was GST impact so Q2 last year jumped higher in sales and this year is a normal year so it remained flat. How many launches company is planning in US in FY19 ? Does the 20 % growth in US business is it in dollar term or rupee term ? It is in rupee term. On R&D there is significant jump in the new base so will it get normalize during the year ? It will stay around 500 Cr for the year ? Did US market is turning around and creating opportunity ? Fundamentals has now changed and that is new base and that is there to stay and it also depend on the supply side from companies.There is pricing erosion in some part of portfolio and company have taken 25 % price increase in some part of portfolio. In International business where the supply constraint is over now and is this number of quarter is new base ? Yes this will be the base. On full year basis did the guidance change for current year due to good quarter ? No there will be 14-16 % growth seen on full year basis . Why other expense remain high during the quarter ? Due to R&D , it is routine because marketing expenses are high in Q2. Other than that everything is in-line. How much operating cost of FY19 would be capitalized ? Nothing everything is been carry forward as of today. Company will do it as far as the plants get completed. When will be the monetization will be seen in RP3560 molecule ? It will still take 2-3 years to get completion of clinical studies. 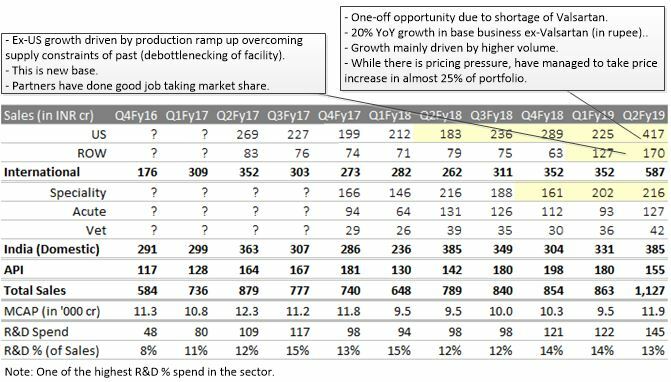 In term of R&D and CAPEX willdrome will start in FY20 and injectable in FY21 ? Drome is now has much more visibility as approval come from USFDA and injectable will start in FY 21-22. Is there is any impact of increase in API Cost ? There is supply disruption as there are so many company stroking it. Company have 2 business vertical and it has same impact on both vertical . As a percentage wise it would not be much higher. In US business which are the opportunity going to pan out ? Company already launch one product in Derma . Rest all will get get launch in next year. It also depend on ANDA approval. What is the company launching target for the year ? 10-15 products for next year. Kindly specify the field for strengthening of company ? 3100 RIP has gone up to 3,00,000 from 2,70,000 last year same quarter. Growth will come from productivity increase and near term there will be no field expansion. What are the strategic changes company made to lead the specialty business ? It is on operation execution and company is working on it to improve. Kindly brief on the ROW market ? On annual basis it is sustainable. Bulk of it happen due to supply backlog last year where company had a dispute and waiting for clarity. So it will be the next base going forward. Will Non-Oral side of ROW is going to increase substantially ? Company is still waiting for approval for facility. What will be the growth driver for ROW business ? Current growth can be considered as base rate and 10-15 new launch expected in same and it depend on supply chain to grow. What will be the CAPEX for FY19 and FY20 ? What number of products will be chunk for the company ? On SGNA in H1 is it right to use that as a base on half year basis ? Yes plus minus 5 %. What will be incremental increase in the overall expense after new facility start ? 200 Cr increment expense will be seen after new facility will start ? How much has the US market increase on sequential basis ? How to think on over 20 % increase in volumes is it sustainable ? US business grown by 20 % some product seen price increase and some see price erosion so it is mix of many things. All supply has gone from one plant and company have no other facilities and it is sustainable. Did company start integrating ORIT product ? Yes and company had launch one of the product and will launch other one also. International business continues to be core focus area and growth driver. Specialty segments in domestic continue to be higher focus area. Gross margin improvement driven by US front-end, backward integrated own API facility, increased export generic and domestic specialty segment contributions. Most of this GM % gain has been invested in R&D. R&D spend up from 4% in Fy11 to 13% in Fy19. Chart illustrates EBIDTA post R&D. Note: Nimble supply chain to react quickly to market opportunities like Aripiprazole/Abilify (in Q2 and Q3Fy16), Valsartan (in Q2Fy19), etc. Alembic pharma gets USFDA approval for Tadalafil tablets of various strength. Total market size of $1.8 billion. Including innovator ELI LILLY there are ten players with ANDA approval for Tadalafil. Alembic has total 77 final and 12 tentative approvals from FDA. Did a demerger announcement go through. Was reading through this article - Alembic goes for demerger but not sure when is the demerger going to happen? Can anyone update on this? Overall, the company looks pretty interesting given that they are doing 400-500 Cr of NP (Which is after a very high R&D expense of 400 Cr+) + there is a huge Capex underway of 1200 Cr which should get operational in couple of years and take the company to the next level.